The most noticeable feature of this case is the adjustable CPU fan. Positioned directly above the main processor is a 60mm fan on a little metal frame. The fan comes equipped with a motherboard connector so that RPM can be monitored, and alarms sounded if necessary. 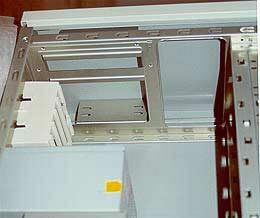 The frame allows the fan to slide along a rail to accommodate multiple configurations for different motherboard layouts. 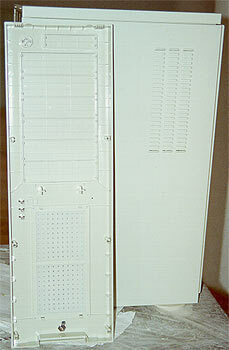 The frame is also removable to accommodate cooling a separate HDD rack at the top of the case if it is so desired. It can also slide along a track in that upper position to accommodate various device configurations, or cooling choices. Insertion of the top HDD requires the case top to be removed prior to installation. The CPU fan is positioned above where a processor will eventually go. A metal frame allows the fan to slide along atrack to accommodate various cooling configurations. The fans on the side of the drive bays are attached by placing them within a plastic box which then snaps into the frame and holds the fan securely. In fact all fans in the SuperMicro case are held in place with similar plastic enclosures. The system is easy to use, and relieves the long screws and tools that would otherwise be necessary to mount the fans. Considering the number of fans on the inside of this case, the huge assortment of fasteners yields many options. One fan is located above the power supply (case exhaust), three are located in the front motherboard compartment, and then one small one sits behind CPU. All these fans mean a fully customizable setup is easy to achieve, and if noise becomes a problem, then fans can easily be disconnected. Behind the four fans cooling the drive bays are punched vents in the side panels. 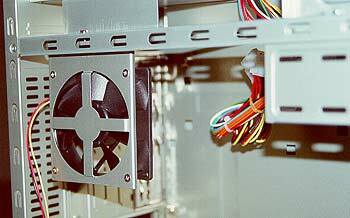 The 8-3/4" X 3-1/4" vents no doubt allow a small amount of cool air to enter the case before being pushed over burning SCSI drives. On the back of the case by the slot cards is a strip of venting measuring 2" X 11", which aids the expulsion of hot air. Finally a small 4" X 9" region on the front of the motherboard compartment acts as an air intake for the majority of the case. This particular set of vents also comes with a small air filter. Not designed to remove fine dust, but larger heatsink clogging particles before they get sucked into the bowels of the computer. The air filter is visible behind the vents on the case bezel. While most cases have their powersupplies flush to the roof, or to one side, Supermicro have constructed theirs so that there exists about 1-1/2" of clear space around all sides. This is undoubtedly to aid cooling, various venting configurations, and allow hotter air to be expelled by the exhaust fan, rather then through the powersupply.